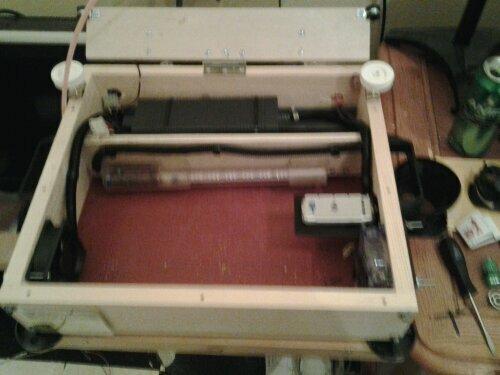 Printrbot original to PB Plus V2 transformation. The upgrade has gone very smoothly so far as im about 80% finished with the upgrade. I still have a few issues to work out and im taking my time to not only build it correctly but, take the time to do the little things like cable management. Underneath most of the printrbots ive seen look like a rats nest of wires. I wanted a better future for my bot so this extra time will be worth it. Another thing I need to work out is the setup for the xbox power supply. I want it to be setup as cleanly as possible so I desoldered the female end of the plug from an xbox motherboard. The only problem is mounting the female connection on the electronics bay as it was never designed for this. More then likely I will have to use a dremel to cut out a slot in the back of the electronics bay. 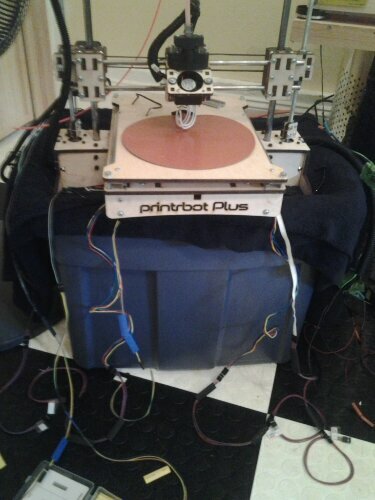 I also want to eventually build a LC case with additional cooling that matches my printrbot. I will most likely be using AndCAD to design tyis enclosure. The reason I prefer AndCAD is simple, its user friendly and runs on the Android platform. I would recommend AndCAD to any new user. There is also a demo version available and it primarily uses DXF import and export files. It is however a 2D program and works well for what I use it for. 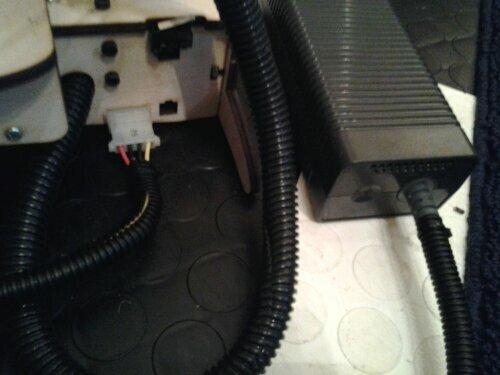 I decided to transfer my xbox PSU wiring over to Molex connectors this gives a more reliable connection between the power supply and the ramps board. I received the wood and hardware kit from printrbot which helped to begin the transformation to version 2. Recently I spent time making all the extensions for the 3d printer wiring as I will be mounting my RAMPS board in my printrstand instead of in the stock electronics bay. This will help with cooling as well as keep the board and drivers in a safe location where they wont be bumped around or risk disconnections while printing. At every wiring junction, especially for the motors I took extra care to make sure all wiring connections were made effeciantly. I also added shrink wrap to help insure agianst any disconnections. Disconnecting any motor wiring while ramps has power will result in the corresponding driver to blow. This included piping everything for the second extruder and thermisisters. I wanted everything to be ready to add the second extruder at any time as I will be upgrading very soon. So far I am very happy with the transformation from the original to V2. As far as the firmware I will load I think Marlin is the way to go. I also took some extra time to label all the wiring. I used photo picture paper to print out labels then I used clear packing tape to cover labels and attach them to each cable. I followed the ramps 1.4 wiring guide to type out all the labels and it has saved a lot of time so far. I also went as far as to create a typed out key of all color coded wiring so future modifications or additions will happen smoothly. Spending the extra time now will save you a lot of headaches later on. 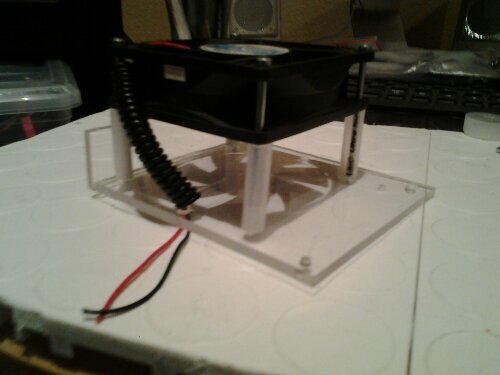 Recently I started working on my dedicated cooling system for the new RAMPS setup. I wanted to run the drivers as cool as possible to help with efficiency and to help them run as long as posdible. My plan is to cut 2 pieces of acrylic. One will make up the base and the other will be set on risers to make up the top. I will mount a fan on the top and more then likely on one side. I also have a standalone air conditioner that I can use to pipe cold air into the Printrstand if needed during hotter extended operation. I haven’t found much online about cooling the driver boards other then a few printable top mounts for fans that dont leave much room for the wiring. I have designed my top mount to be much higher than the typical ones to give more access to the wiring. Below I found a picture some what similar to my design. I decided while a have my Printrbot plus torn apart for the upgrade I might as well upgrade even more parts. So tomorrow I will be ordering new ACME rods, anti-backlash nuts, GT2 belts, aluminum pullys and LCD. I will start with the parts needed the most at the moment and see if I have time and money left for the less important things such as the LCD. ACME rods and anti-backlash nuts should give me quite a noticeable difference in print quality. That coupled with GT2 belts and aluminum pullys will put my print quality towards the top of what is possible with my current platform. I have already replaced all 5 of my stepper motors with Kysan’s, which in my opinion are one of the best. The run fast, cooler and a lot smoother then the majority of other motors I’ve used in the past. I also recieved my 1.75mm ubis hotend which will be the 2nd extruder on my Printrbot plus for my dual bowden extruder setup. 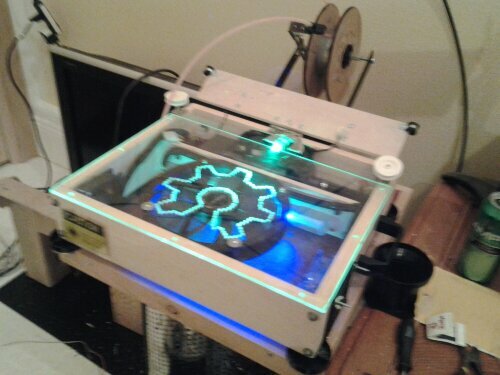 At a later point I may try 2 of Printrbot direct drive extruders that will be cut out using my CNC machine. During all of this upgrade I will be also building a Printrbot simple that was cut out on my CNC as well. I will try to update as I go.